After many leaks, Samsung has finally announced the Galaxy S5 Active. Like last year's Galaxy S4 Active, the S5 Active is a ruggedized version of the Galaxy S5 smartphone. The body is water, dust and shockproof with its IP67 and MIL-spec 810G certification. The standard Galaxy S5 was already two of those things but some people will definitely appreciate the extra peace of mind that comes from a ruggedized phone. Unlike the S4 Active, the S5 comes with fewer compromises compared to the standard S5. The only major feature missing is the fingerprint sensor in the home button, which wasn't all that great to begin with. Rest of the specifications remain identical. The S5 Active also has an extra button on the side for 'Activity Zone', a single place for all your outdoor activity related features. 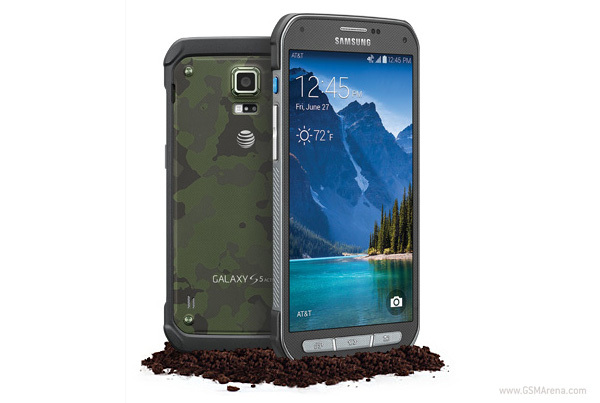 The Galaxy S5 Active is available from AT&T in the US for $200 on a two-year contract, or for $715 contract-free. If you buy the phone you also get a 50% discount on the Gear Fit. The phone is available in Camo Green, Titanium Grey and Ruby Red. No fm radio on the Samsung s5 active. Does this phone ever coming to the UK? or Europe? Its amazing, but I wont get much fun with us specs in Europe. Does it stay AT&T exclusive forever?